Oldie But A Goldie: Single Screen Movie Theatres In Pune That You Must Visit! Do you want the cheapest places you can catch a movie in Pune? Here are the five one screen movie halls that will not only show their historical presence but also give you a decent experience for watching a movie. The Victory Theatre is an average quality theatre situated at camp, Pune. The rate of tickets is high (regular INR100/- Balcony INR 120/-) in comparison to the facilities the theatre provides. Seats are ok. Staffs are average and washroom and toilets are also clean. The screen is not too big and the sound quality is also not very good in consideration that it is 31 years old. It is best only for normal 2D movies. Now you go and decide whether you like to go to victory theatre or not! 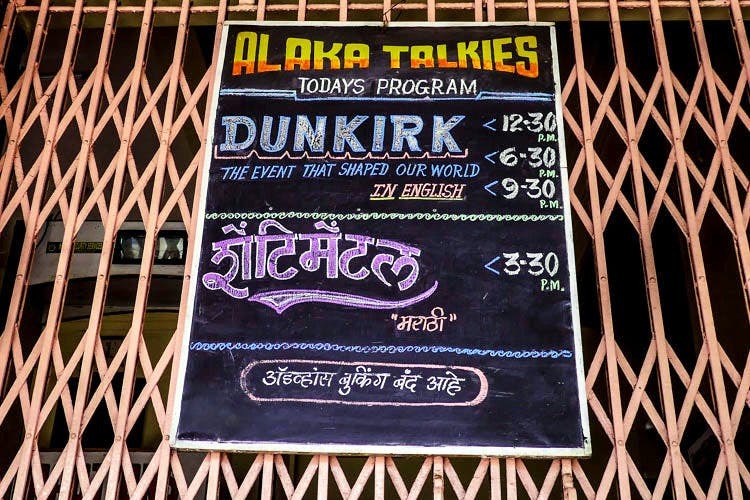 With its legacy of 47 years, Alka talkies are 2nd oldest cinema theatre in Pune. Located at Tilak road, it is a great place to watch a movie in a budget. Most of the college students go for it and the rates are also cheap. Regular prices start at INR 40 while balcony seats are priced at INR 50. They don’t have a very good canteen, but outside theatre, you can find many stalls to eat. If you have budget constraints and still want to go for the movie, this is the place you are looking for. Have you ever wondered what old premium cinema hall looks like and had a zeal of going there? Well, Apollo is the place you should be considering. It has very cheap tickets are available. Not big screen as multiplex but sitting arrangement quite good. If u want to watch the movie in less money then u can go Apollo Theatre (INR. 40 and INR.50). There is one Chowpatty for fast food too. Give it a try yourself. This is the place which has its presence in Pune for over 42 years and still has, great experience of movies good sound quality and seating is excellent too. With the decent rates of INR 80 and INR 100 for regular and balcony, they have the good crowd who come to watch a movie. Located in Sadashiv Peth, one of the crowded and known places in Pune, this is the theatre to watch. Give this a shot! Having been in the movie hall business for 51 years, Apsara is THE oldest movie hall in Pune. You still get the feel of going to a historic place but with a new mix. With an excellent sound and video system, the seats are also very comfortable. The canteen is also very good. A typical Pune crown who has been there continues to go there. And one of the new things for this particularly is you can book tickets online too and their tickets value, Regular: INR 40, Balcony: INR 50.